Microsoft SQL Server 2017 Client Access Licenses are an important part of SQL Server 2017 licensing! Each user and device connected to your SQL Server instances will need to have a Client Access License (or CAL) to remain in compliance with Microsoft’s terms of service. Microsoft gives one user or one device per every single CAL purchased the right to access any addition (Standard or Enterprise) of Microsoft SQL Server 2017 they choose! 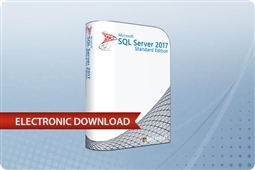 Aventis Systems is proud to offer a variety of Microsoft SQL Server 2017 CALs for you business to choose from! Single, 5, 10, 25, and 50 packs of user and device CALs are available. Additionally, should you want upgrade rights to the next version of Microsoft SQL and the ability to transfer your CALs over when you upgrade in the future client access licenses with Microsoft Software Assurance are available. Per Core Licensing of Microsoft SQL 2017 does not come with user or device CALs as a part of the license. So shop below and make sure your team stays compliant with Microsoft SQL Server 2017 Client Access Licenses! Looking for more Aventis Systems offerings on Microsoft SQL software? Check out our Microsoft SQL section for all the best databasing software from Microsoft SQL to meet your IT requirements. Also, check out our complete Software product offerings from OEMs such as Microsoft, Symantec, VMWare, Veeam, Acronis, Adobe, McAfee, and Red Hat for awesome additional software suites!